I want to share my unforgettable impressions of traveling by hitchhiking in Europe. One lovely morning my trip to the Balkans began. I had been dreaming a lot about them, and I wanted to cover the entire map of Europe before I went to Asia. I decided to go there alone, but since there were so many beautiful lakes, national parks, beaches and finally mountains, I realized that maybe I needed a tent. More equipment will allow you to be more independent and see more cool places. So I wrote in the local web-page tourist club concerning the partnership, so as to share the joy and sometimes the sorrow of the trip, as well as the necessary equipment. Well, of course, it would be more secure. So, in the morning, we woke up and then started standing on a road with very few cars, to try to get to the point where we needed to catch a train. Of course, we did not have time for the train, only 20 minutes in total. Hitchhiking is unpredictable. Especially when you are two and with huge backpacks. But we still caught up with the train and reached and crossed the border. So we drove across the border to Zahony and after changing four cars we were in Budapest. What can I say, It was not fast, it was necessary to wait an hour on average, but at least it was free. Note, speaking English with drivers, you may face some problems. You really have to draw youself a map or use a few words in Russian, but we met some interesting people - one, 80 years old granny, without hesitation stopped near us, drove along the highway 140 km / h and smoked like she is a real go-getter young girl. When 120 km remained to Budapest it started to get dark. There was a problem here. Because it was dark, we could not see anything, and also we didn’t have a big desire to sleep somewhere in a field. So we turned on the lights on our phones and lit them on the cardboard and on ourselves. And in 10 minutes we picked up a guy who asked immediately the address of the hostel and brought us directly to the building! Aah, our savior! The owner of our hostel had some beer with friends in the pub, so we joined them for a while and then slightly tired he led us home. We quickly checked out the places to visit for tomorrow and then the tired people went to bed. 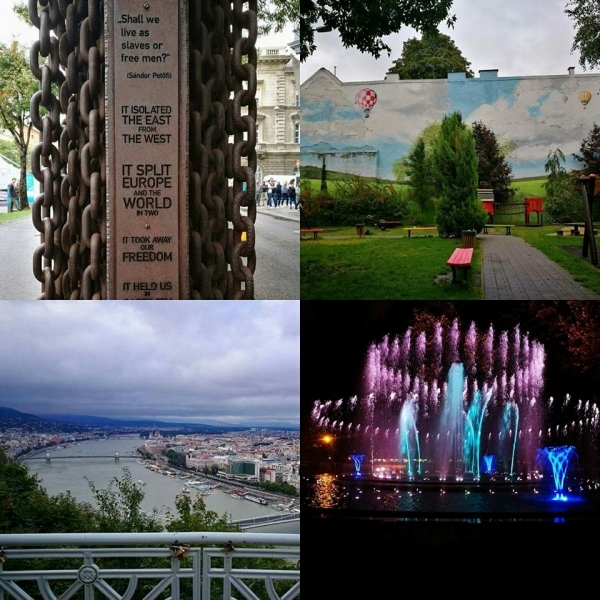 In spite of the bad weather conditions (it was a cold rainy morning before dinner, sometimes just a few drops, but sometimes heavy rain – walking through was like swimming over a waterfall ), we sincerely enjoyed Budapest! Elegant architecture, magnificent houses, but at the same time, you do not feel that this monumentality is in your head. Lots of space, an entire island with parks, alleys and recreation areas. Wide streets, friendly people. We got to some kind of street fair where there was again a bunch of tastings. So lunch was a lot of tasting from home-made jam, waffles, cakes, nuts to baked pies with cabbage. Then it started to rain stronger again and we immediately went home, where the owner of our hostel David cooked the dinner and treated us! Clever dude! We had a rest and after waiting for the rain to end we went for a walk. I want to mention the singing fountain because I love such things very much! Then we finally got home, as David offered to go to another pub. And though everyone was already very exhausted, we still agreed and it turned out to be the best pub that I've ever been! An abandoned room, which turned into a cool old-school institution! Total trash, a collection of all nonsense things that you can imagine, on the walls, everywhere in the interior. There is a huge area, and the people there are simply incredible, in one word extraordinary. We identified the hitchhiking point and drove to it with the tram, and then walked another couple miles. After twenty minutes waiting, we caught the first car, and then it was the fastest hitchhiking in my life. When the first car turned to go back to the autobahn, we immediately stopped another car in 40 seconds! The first car we stopped was driven by a woman who was a lawyer with an assistant who was going to court. They threw us into the center of a small town Veszprem, where we quickly walked around and moved further on foot towards the lake. The main plan was to get to Balaton, to find a good place for spending a night there and to head into Ljubljana in the morning. So we took some short routes, admiring the scenery and stopping along the road in search of the right place. One of the drivers offered to buy us something to eat after listening to our story because he was driving to the grocery store. We did not want to look weird or greedy, so we just took a few tomatoes, some bananas, and cookies. Balaton is very beautiful. The water is a glowing, bright-blue turquoise color and the size of the lake is impressive! I really wanted us to spread the tent somewhere near the water, even to swim (although the water was not warm), but it did not work out. Initially, one of the drivers said that after 5 p.m. we should expect a thunderstorm. So then we stopped another car with a lady who was driving to a village on the highway to Ljubljana. I'll add that on the way the feeling that I'm somewhere in Italy didn’t leave me. As I was told then, this region of Hungary is called little Tuscany. Small chippy villages, vineyards (a specific taste to the wine comes from the ancient volcanoes territory in these places), a lake, small mountains around. Very, very nice! And now for my personal experience. I already see all of life as a plan, but pre-planned travel with a clear plan is not mine. In fact, you could say I'm definitely for spontaneous adventures, elements of an accident, when you have only an approximate route, and all the rest - total improvisation! When one moment you feel that everything is rolling into the abyss, and the next it turns out in a way you could not imagine! In spontaneous wandering, you decide everything on the spot, here and now. And you have to feel at least once in your life how it is to be in a foreign country, with people around who speak in unfamiliar languages, and you have to decide where to go, what to do and think "well, well, I need it, I'm tired, I want a chocolate bar and a bed, "and in 30 seconds, oh, see what a clown / funny / interesting statue / building / park / dog / signboard / and many more things really worthy of attention." From such a trip, you return a different person. Once you get in the right frame of mind, I think anything's possible, with proper experience and a wide worldview. Everyone can understand such things, but - probably not something that is even difficult to tell/describe / share with a glass of wine in the pub. The emotions, smells, some kind of pictures and photo shoots in mind, the noise of the sea, the touch of the stones, which are 1500 years old, the starry sky, a piece of bun, which the driver shared, and which at that moment seemed to be the most delicious in the world. This is my wealth. This is something that will always be with you.